Nonprofits, participating agencies, Galaxy Digital, and volunteers alike work, often tirelessly, toward a common goal: to shape better, more caring communities. The collective efforts of this network help to make a tangible difference. However, the logistics of managing a volunteer agency can become overwhelming for many who are already short on time and funds. The goal of Get Connected is to streamline volunteer management: to allow nonprofits and their network of agencies to come together in one place and share resources. While Connect software is generally intuitive, it’s important to establish a foundation of best practices to get the most from any platform. 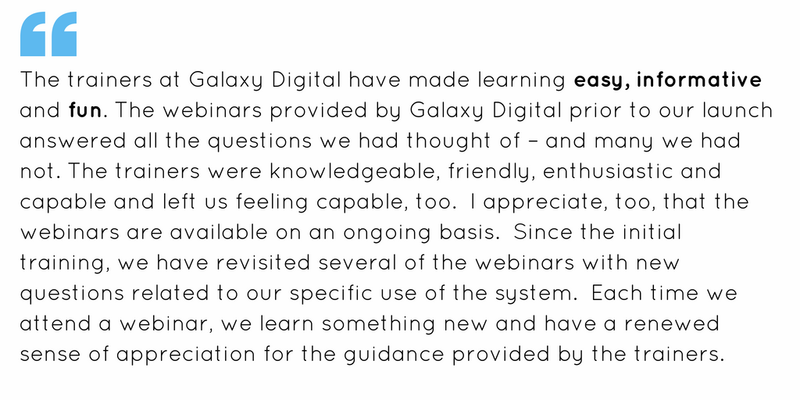 To this end, Galaxy Digital offers free training for agency managers who are joining a host nonprofit’s site. Time and time again, we’ve seen that trained agency managers are more enthusiastic, engaged members of a Get Connected platform because they know and understand it from the outset — and they know how it can benefit their agencies and communities. 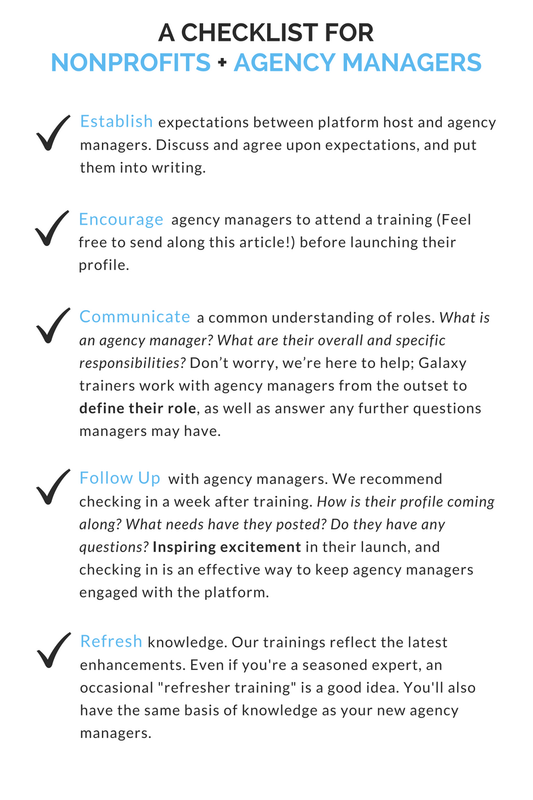 For those reasons and more, we encourage you to encourage your agency managers to sign up for a training. Digging deeper: What does training cover? Our regularly scheduled sessions last about 45 minutes and are free — which means little risk with plenty of reward! Attending a training implies a first step in ownership. We’ve seen that agency managers are more likely to be engaged participants if they have a foundation of knowledge and responsibility from the outset. 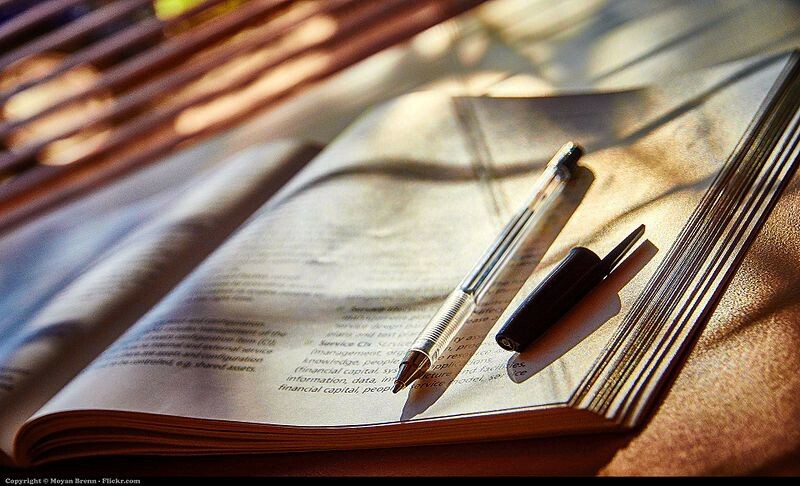 Trained agency managers more out of the site than un-trained ones, and training also saves time in the long-run; spending 45 minutes to learn at the start means agencies can forge ahead with confidence and efficiency, building their profiles and posting needs. We also believe that it’s best for users to understand the value of Get Connected first-hand. If an agency manager takes the time to acquire knowledge and learn best practices prior to launch, they are more likely to engage with your site consistently and effectively. Take a look at our checklist for nonprofits and agency managers to see how you can help transform your nonprofit partners’ Get Connected experience. Signing up is simple. Just contact our Customer Care team with any questions. Once they have confirmed your client status, they can send you a link. Trainings occur every Monday via webinar. The trainer will share their screen so the agency managers can follow along. If you’d like a more tailored experience for your agencies, you can request a custom training session with Michelle. Have you taken an agency training recently? Let us know in the comments how it’s helped you or your agency managers use Get Connected more effectively. We just might quote you in a later blog post!